I needed a laugh last night and I got a hundred. I watched Show People: a silent film spoofing the making of silent films and the phony stars who star in them—one of the funniest movies, silent or sound, that I’ve ever seen. It’s sad, too. A few tears are inevitable in a film about people who desperately want things, as the two leads in this one do. Peggy Pepper and Billy Boone want to be movie stars. They’re slapstick clowns angling for jobs with High Art Studio, which makes films no one is allowed to laugh at. Billy fails, and is crushed. Peggy succeeds, at the cost of her sense of self. “Make ’em laugh, and you make ’em happy,” Billy tells Peggy, early on. He was referring to the audience, unaware that the maxim also applied to him and her. Show People stars Marion Davies as Peggy, in a tour de force performance recalling the best work of Lucille Ball. Peggy arrives at the studio an ingénue, in the back of a car driven by her father (Dell Henderson)—a Southern colonel whose rank must be taken on faith. When she meets Billy in the studio cafeteria, she puts on airs, but does it badly. I liked this. Show People doesn’t explain away phoniness as a consequence of success or failure—it’s a flaw to which insecure people are prone. Peggy is never herself; even early on, when she has nothing to lose. And in any case, Billy isn’t fooled. He promises to get her a job. Billy’s character is an interesting one. 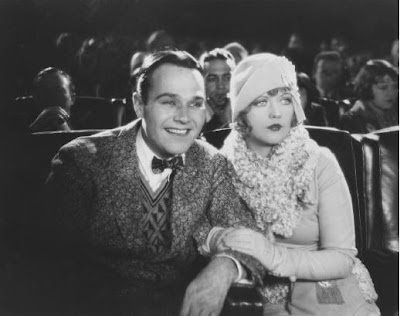 He’s played by William Haines, a talented physical comedian who had a remarkably innocent face—handsome, but fragile. When Billy’s happy, which seems to be a lot of the time, his grin is as wide as the world. When things go wrong, it’s like he’s being pulled to the depths of a black pit. Billy Boone is part of a slapstick film company, Comet Studio. He plays a stock character (never named) who wears a wide moustache. It’s a garish look, clearly inspired by Keystone players. The company’s comedy is broad, violent and overacted; Peggy, with her dreams of melodramatic stardom, is dropped into it without preparation; but she proves a natural. Her mugging co-stars spray her in the face with seltzer water and her reaction seems real. In fact, it is. She wasn’t expecting such treatment. Show People’s director is King Vidor, a man who, despite having the longest career of any director, anywhere, ever, tends to be underrated by movie fans today. His greatest silent films, including The Crowd (1928), and this one, feature archetypal characters imbued with the emotional complexity and individuality found in a good talkie. Peggy is the Innocent Who Makes it Big and Gets a Swelled Head; Billy is the Honest Man She Leaves Behind; and there is a Lesson. But we still care about these people. They still make us cry. And laugh, and laugh, and laugh. Show People works as satire, as slapstick, as situation comedy, sometimes all at once. After Peggy scores her contract with High Art, we’re treated to the film’s funniest scene, as an exasperated director tries and fails to make her cry on cue. Onions, music—nothing works. Peggy even smacks her head against a wooden beam. “Imagine your father starving to death!” the director implores. Peggy just bursts out laughing—and we cut to a scene of portly Dell Henderson raiding the fridge. When Peggy finally does make it big—devolving into ‘Patricia Pepoire’—she develops a twitch: a toothy sneer that reminded me of Gloria Swanson’s. This isn’t just funny, it’s insightful. The farther Peggy drifts from her true self, the more compulsive she becomes about maintaining her image. 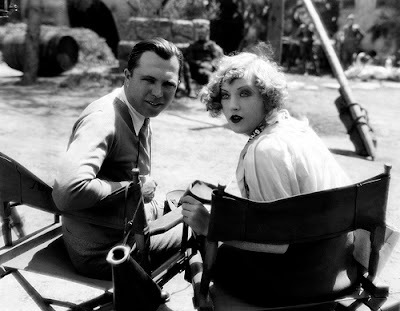 Show People is most famous for its list of superstar cameos, which also it make it doubly fun for silent film fans. Peggy sees John Gilbert—the real one—the day she arrives in Hollywood. Later, as a big star, she dines at a long table with Mae Murray, Douglas Fairbanks, William S. Hart, Dorothy Sebastian, Norma Talmadge, Karl Dane and others. She also brushes off an out-of-costume Charlie Chaplin, failing to recognize him. But the cameos get deeper and more thoughtful. Vidor himself appears on-camera—as a director, playing himself. Gilbert shares the film (though never a scene), with Paul Ralli, who plays Patricia’s boyfriend, Andre Telefair, as a nasty parody of John Gilbert. The most surreal moment comes when Peggy asks a friend for the identity of the blonde walking by—told it’s Marion Davies, she declares herself unimpressed. The blonde really is Davies, dressed differently. Peggy is so out of touch that she can’t even recognize the actress playing her. It’s fantastic. I’ll be thinking about Show People for a long time after this. And I’ll revisit it soon—not just because it’s novel in content, and profound in structure, but because it’s so damned funny. See the classics of silent film first—the works of Chaplin and Keaton, Lang and Murnau and Griffith—then see this one. You’ll realize it belongs right up there with the rest. I saw SHOW PEOPLE earlier this year at Film Forum with live accompaniment and a sold out crowd. The biggest response was for the moment where Peggy sees Marion. Very meta. It really is. And it's shocking too, because no matter how many crazy cameos you've seen by then, you'd never imagine one like that. The biggest single laugh, for me, was the cut-away gag with her dad gorging on the turkey leg. I almost fell off the couch. Ooh, I'm interested. If I can get a working TV/DVD player I will watch it!